Very infrequently does a truly superb behind-the-curtain story come across my computer screen. This weekend I was fortunate to receive such an impressive gift. This free online manuscript by Dan Eden of Viewzone.com describing his personal experiences with HAARP, NSA, petrogyphs, Ark of the Covenant, orbs, vortices, and sacred sites, to name only a few, is mesmerizing and better than any fiction novel I have recently read. Though longer than your bathroom or morning coffee break it is well worth the time it takes to assimilate the entire message in one sitting. I couldn't stop turning page after page until I came to his last words, "Keep your eyes open." So I highly recommend you either read it... But be warned, it is highly addictive, entertaining, and most importantly, enlightening. And according to to the author...all true! 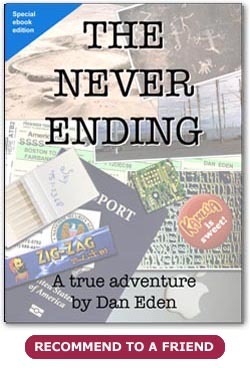 I've been reading a part of an electronical version of Dan Eden's 'NEVER ENDING; A true account of world's greatest cover-up', a fascinating story that has kept me hooked for the last three days. Dan eden is an editor of Viewzone Magazine, which in my opinion, is a source of reliable information. Although a lot of subjects (HAARP, Petroglyphs) and certain people (James Hurtak, author of 'The keys of Enoch') in this book really exist, I still believe it's a work of fiction since it reads like a novel. The author, who's real name is Gary Vey, shows a lot of his personal life and describes his true emotions. This is a must read for everybody... its... long but very easy to read.. and once you start you will be hooked.. what does the story cover?.. what doesnt it cover!! Alaska, HAARP, death rays, holes in the ozone layer, black operations, NSA, colorado, ancient writings, energy grid points throughout the world, Australia, Yemen, Ark of the Covenant, Queen Sheba, King Solomon, free energy, murder, threats and its all true.. camerlengo has contacted the author gary vey and confirmed the story is accurate.. this a story close to my heart as one the major sites for finding these petroglyphs is 4-5 hours from where i live! You know i wouldnt waste your time good people.. and i know you wont be sorry when you take 1-2 hours out of your day to read this amazing story.. I will be doing some follow up posts on this.. after reading the story the link above in regards to yemen will make so much sense for you.. enjoy! I've spent the last three days in my spare time reading the amazing article on Viewzone "The Never Ending" which someone linked to on the weather manipulation thread. If you haven't read it, long as it is you ought to take the time. I am sure many parts of the article could be discussed in depth, and I have no problem if that happens here, but I wanted to point out a very interesting synch that I just found. In the spirited Indiana Jones tradition, editor, journalist and computer programmer, Dan Eden finds himself transported from a sleepy New England suburb to a waking nightmare in the barren Alaskan tundra, the unpredictable vortices of Yemen and ultimately the wilderness of the Australian Outback. Eden accidentally stumbles into what turns out to be the most startling revelation of his life. Besieged by his newly-discovered destiny as prophesied translator of ancient texts, he learns he holds the key for unlocking secrets that have the power to change the course of history. From that point on, Eden becomes one of the most wanted—and haunted--persons on the planet. Asks Eden: "If there is an organized deity, could there also be an organized counterpart--an evil empire--organized on a global scale, poised to fight for control of each [geographic spot where there is a] vortex [or ‘whirlpool of energy’]?"